AMD has introduced its first Southern Islands GPU, the AMD Radeon HD 7970, featuring a record 4.31 billion transistors, more than 1.5x its previous generation’s single-GPU flagship, the HD 6970, and more than twice the HD 5870. 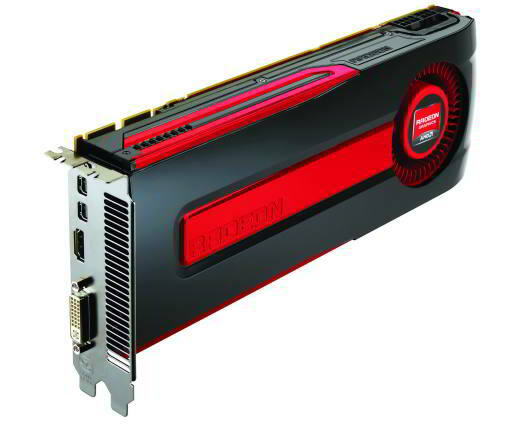 The Radeon HD 7970 is based on AMD’s new Tahiti GPU, and features the company’s brand new Graphics Core Next (GCN) architecture. The AMD Radeon HD 7970 has a couple of other firsts to its name – it’s the first graphics card to use a 28nm GPU, as well as the first card with support for Direct3D 11.1 (though the first drivers for the new standard are expected only with Windows 8 beta, early next year). The HD 7970’s Tahiti GPU is fabricated on the new High-K process at TSMC, and has a die size of 365mm2. Expected to release on January 9th, at the CES 2012 trade show, the AMD Radeon HD 7970 has been given an MSRP of $550, placing it in direct competition with Nvidia’s single-GPU flagship – the GeForce GTX 580, while being slightly more expensive, and effectively replacing the HD 6970. Pricing is expected to drop after a while however, effectively transferring the cost saving of the 28nm process to the user. Lower end Southern Islands GPUs expected are the Pitcairn and Cape Verde. The new card has much improved tessellation as well as overall performance, finally beating the Fermi architecture at its own game. The HD 7970 is between 5% and 35% faster than NVIDIA’s GeForce GTX 580, depending on the benchmark. Some benchmarks, showed the single GPU HD 7970 outpacing a GTX 580 SLI combination by a significant margin. Refer to AnandTech’s benchmarks for a closer look at the performance differences. Before getting to the new architecture, we take a brief look at the hardware specifications of the AMD Radeon HD 7970. It contains 2048 stream processors, a 384bit memory bus, 3GB of GDDR5 video memory, a 925MHz core clock, a 5.5GHz memory clock (effective), 32ROPs, and 128 texture units divided into 32 CUs (AMD’s new Compute Units). 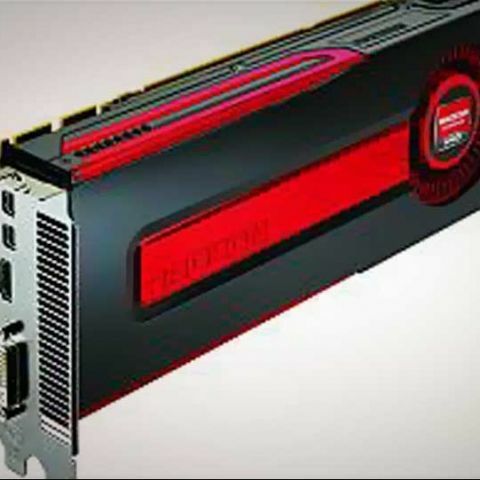 With the new architecture, the Radeon HD 7970 is rated to deliver 3.79TFLOPs of theoretical computing performance. Memory bandwidth is a startling 264GB/sec. The Radeon HD 7970 is much more powerful than the 6970, but thanks to the new process as well as the new power management technology, has a healthier TDP of 220W (250W PowerTune limit). It has a 15W idle power consumption, which drops to as low as 3W with ZeroCore Power technology – which almost completely switches off the GPU when not required, even cycling down the fan when the display is off. This also makes it much quieter. The new Graphics Core Next architecture is completely new in many ways, primarily replacing the Very Long Instruction Wordset (VLIW4 in the recent Cayman GPU offering) Stream Processor architecture with a new non-VLIW SIMD-based one. The move places emphasis on general computing tasks, and its benefits will be seen not just for discrete GPUs, but also AMD’s future Fusion and Bulldozer offerings. The new SIMD focuses on getting better thread level parallelism (TLP), rather than instruction level parallelism, which the VLIW architecture excelled at. Principally, the biggest difference between the two architectures is the utilization of ALUs, with the GCN architecture allowing the GPU to schedule tasks ahead of time, and still enable dynamic scheduling during execution. This ensures that less processing units sit idle, and are used to even higher efficiency. Refer to AnandTech’s illuminating article about the new Graphics Core Next architecture for more information of how exactly all this works. Apart from ZeroCore Power technology, there are plenty of other new features on the HD 7970, such as Digital Discrete Multipoint Audio (DDMA), which allows for sound to embedded at multiple output points via DisplayPort or HDMI ports, such as each monitor’s speakers in a multi-display setup. This provides improved surround sound capability. Also new, is D3D11.1 hardware support, which has such features as Target Independent Rasterization. As in the case of the D3D10 or D3D11 releases, here the hardware is ahead of the actual API’s release, but will obviously have to wait for it before becoming useful – wait until a Windows 8 beta Catalyst driver is released. AMD has introduced Fast HDMI with the HD 7970 and the Southern Islands GPUs, with increased support for 4K x 2K displays, with new cables supporting the higher clocked transmissions, from 165MHz up to 340MHz. Another new feature, developed as direct competition to Intel’s Quick Sync feature, is AMD’s Video Codec Engine (VCE). This feature will also be in future AMD Fusion APUs. 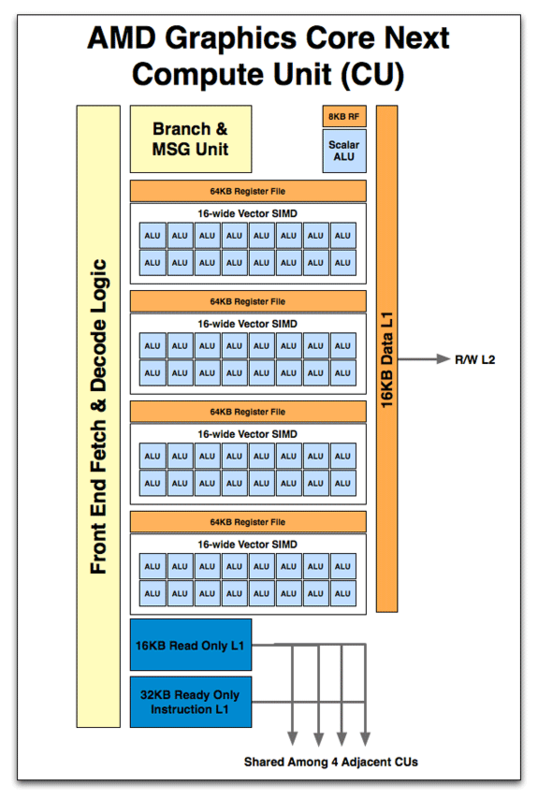 The new hardware H.264 encoders of the VCE system work in Full Mode or Hybrid Mode. In the energy efficient Full Mode, it uses the fixed function hardware on the GPU. With Hybrid Mode, only Entropy Encode is handled by fixed function hardware, while other steps will be handled by the GPU itself, enabling near archival quality encodes. For now, as AMD has not provided information on the topic, it is assumed the first crop of Southern Islands GPUs will use the last-generation’s UVD3 (Universal Video Decoder). AMD has also brought Steady Video 2.0 to the GPU family, adding support for interlaced and letter/pillar boxed content, apart from an improved steadying effect. It uses a Quad Sum of Absolute Differences (QSAD) instruction set, combining SAD operations and alignment operations into a single instruction. The HD 7970 will also support Partially Resident Textures (PRT), popularized by John Carmack with his MegaTexture technology. This concept splits textures into tiles, where tiles will only be mapped/pinned as necessary. This will help reduce the workload of the GPU, freeing it for other tasks. Last, but not least, is support for PCI Express 3.0. Benefits of this are not seen at the gaming level, where PCIe 2.0’s bandwidth is still more than enough. PCIe 3.0 benefits will be best seen in general computing tasks, with lowered latency times. PCIe 3.0 doubles the transport bandwidth to 1GB/sec per lane bidirectional. AMD has also refreshed its reference design of the HD 6970 for the HD 7970, with a new removable plastic shroud that is rounded to improve airflow. CrossFire enthusiasts will also be glad to know, AMD has gotten rid of the backplate, providing 2.7mm of space, extra. The HD 7970 will be approximately 10.5-inches in length, excluding a new reinforcement plate, which brings the total length to 11-inches, nearly 0.5-inches longer than the HD 6970 and 5870. This means squeezing in the card into a regular ATX cabinet is still not going to be an easy task. AMD has tweaked the blower, making it larger at 75mm, and quieter. Gone is the secondary DVI port, heralding the return of the full slot exhaust vent. There is now a single DL-DVI port, along with an HDMI port and 2 miniDP ports. Users expected to use SL-DVI port will now be forced to use an HDMI or miniDP port, hence, AMD will require that partners ship both an HDMI to SL-DVI adaptor and an active miniDP to SL-DVI adaptor. This will also enable users to drive up to 3 DVI monitors, right out of the box.